Perry, who is on a nationwide campaign to attract more business to Texas by touting its business-friendly tax climate, is directly targeting Maryland with radio and TV ads running in the state. "When you grow tired of Maryland taxes squeezing every time out of your business, think Texas, where we created more jobs than all other states combined," says Perry in the ads, "Maybe it's time to move your business to Texas." Perry is also touring Maryland's largest gun manufacturer today as part of the ongoing effort to lure businesses to his home state. O'Malley hit back with Washington Post op-ed arguing Maryland is a better place for business and jobs than Texas. He accuses Perry of slashing funding for education, health care and infrastructure. O'Malley says as a result, "Texas ranks 49th in high school graduation, 10th in the rate of poverty, and 50th in the percent of residents with even basic health insurance." Watch the debate at 6:30pm ET on CNN. Please stop beating a deadhorse ..everybody is tired of hearing about obamacare after what we just went through ..find another topic instead of trying to start fights. I listened to S.E. Cupp compare the words Yankees and Fighting Irish to Redskins! I can't believe how ignorant and insensitive that is to Native Americans. Hmm. The national unemployment rate stands at roughly 7.5%; for Texas, it's 6.5%; for Maryland, it's 7.1%. Now we also have North Dakota who is beating both of them with an unemployment rate of 3.0%; the best in the Country, at the moment. For a sense of scale; the worst state is Nevada, with a whopping 9.5%. That's quite a degree of difference between 3.0% and 9.5%. An interesting conversation would be a followup between Texas, Maryland, North Dakota, and Nevada; where all four states have a heart to heart conversation regarding the reasons why they have the unemployment rates that they do. More useful than this tired dialogue about how Democrats are all secretly Marxists and how Republicans are all secretly fascists would be a discussion about how political policy influences the failure rate of small to medium sized businesses in each state... supported with charts, data, and cited sources for the statistics. Low taxes in a state makes very little difference for a small business that makes less than $25,000/yr in revenue. If said business becomes successful and begins to become threatening for the other larger, more senior businesses in the market; if the larger business were to trump up a frivolous patent lawsuit (since the average lawsuit costs about $5 million) to wipe out the potential competition of the small business (which has never seen even close to that amount of revenue), then this practice will increase the failure rates of small businesses if these practices are widespread. Over a course of 5 years, these systematic issues will influence the unemployment rate of a state. Successful small businesses will hire workers. Lots of successful small businesses will hire lots of workers. Caterpillar, Facebook, Ebay, and Toyota are earning enough revenue that low taxes makes a difference to them, but to a small business, they would tend to care far more about their survival rate. For Texas a 4 year college tuition costs on average: $8354 after a five year increase of 18%. In Maryland, it's: $8220 after a five year increase of about 2%. Maryland wins here. In Texas a 2 year college tuition costs on average: $2131 after a five year increase of 17%. In Maryland, it's: $3875 after a five year increase of 8%. Texas wins here as long as this $2131 doesn't increase at a crazy rate over the next 10 years. Long term if only the rich can afford a decent education, then we the people of the United States of America will have lost the American Dream. We can look forward to the new and improved Victorian Era; if you want to see what that was like, read Oliver Twist by Charles Dickens; that was a great time to live if you were rich, but it was horrible for everyone else. So ask yourselves this question: "If the Ludlow Massacre were to repeat itself sometime in the next 50 years; which state would be the most likely perpetrator of the event?" If I were in abject poverty, I wouldn't really want to be in either one of these states. Ayn Rand and Lenin can go in a corner and chew on a cookie for all I care. O'Malley is a Liberal Democrat Who Will Spend Your Money Til You Are In The Poor House And He Is In The White House !!! Stephanie Cutter needs to take Statistical Analysis 101. Having a LOW debt PER CAPITA is good thing. How about having Crossfire repeated at another time. 6:30 p.m. is terrible for a half hour program. MSNBC rebroadcasts many of their week night news programs and CNN does a few. 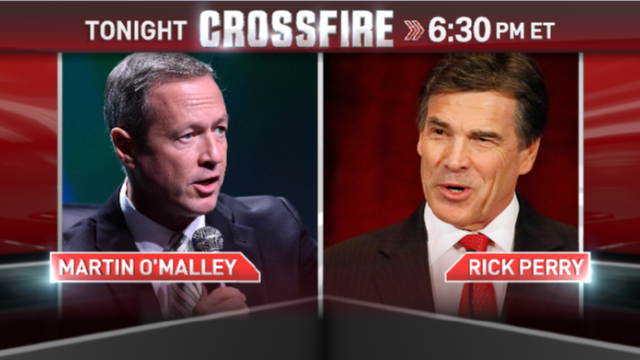 Let's see a couple of rebroadcasts of Crossfire. O'Malley should answer questions about #JusticeForEthan – don't hide from the truth! What happened to Newt? He is a gutless, passionless debater. ...in other words? crossfirers NO BRAINER. You'll post that won't ya? Texas is the minimum wage state,and perry and the republicans are proud of it. Well. Let me see. Fairyland is overrun with kaaweers. Texas is overrun with illegals. In Fairyland, you get jeer and scorn if you say the truth. In Texas, you get a reward for every dead illegal you bring in. Let me guess where the sane person goes? Well.. Perry is technically right. It's true that anyone in Texas "has access to healthcare." That means they can go to the ER and get "checked out" by a physician who will then send them home with a precription for a bottle of pills (they may not be able to afford) and a "tongue-in-cheek" directive to "follow up with your regular physician" which they already know doesn't exist. had for the opportunity to just see a doctor. The diagnoses did come in though, "thyroid condition." Yes, that explained the weight loss and hair falling out - and it would be several more years before she collapsed in the floor with two broken hips inflicted by untreated bone cancer that she didn't even know she had - because her condition had been diagnosed after all. So Texas got a fair deal. She worked for minimum wage until 2 weeks before she died, so Perry could go on CNN and brag about "freedom". Freedom to die at 40 from curable disease. It is an uncomfortable truth that the Affordable Care Act exists for a reason. That reason is to save lives from a greed infested heathcare system that has shown no sincere effort to put lives ahead of profits and stop killing people. Obamacare isn't perfect but the same dedication being used to try to destroy it could go far to improve it. Perry knows this is true and he should be ashamed. After reading your current comments it is evident that your listeners are completely one sided, that is left of Lenin! Your snarky comment exposes the fact that you were/are unaware that Perry's torqued back had him on pain meds at the time of that gaff. Lets see you stand and deliver at peak performance under the same circumstances. If, as CNN's page says above, O'Malley's Washington Post op Ed piece said Texas is 49th in high school graduation rate, he is a flat out liar. There's s surprise. Look it up for yourself. just saw stephanie cutter on crossfire – my first time seeing this show (used to watch the old one regularly). i was very impressed by her preparation, presentation and deliberation. she gave rick perry a run for his money. go stephanie. you should be a very good contribution to the show. As soon as I retire (2. 5 yrs). I'm the hell out of MD. I'm a fed up lifelong Democrat. South Carolina looks good. O'Malley is taxing the rain, and he said he would not raise taxes but raised tolls and sales tax and fuel tax. Someone tell Stephanie that Perry doesn't charge all those large companies taxes if they move here. And every year Dell lays off 500 employees. 1 in 6 Texas children don't have health care. The No Child Left Behind state can't get of the cellar with their education ratings. How can Perry brag about below minimum wage jobs? Thats embarrassing if anything. I'll be tuning in and hoping Perry can remember his talking points. Most people can remember seven, plus or minus two, but because Perry can't remember three, I hope he limits his talking points to groups of two. Perry is no rocket scientist, but he must how to attract jobs to his state. I've got family in both Austin and the DFW area, and they tell me that Texas is booming. Yes, there are alot of minimum wage workers, but that's because there are so many minimum wage jobs...but there's nothing wrong with that! 50% of minimum wage workers move to higher paying jobs within a year, and 80% within 2 years... they're entry level jobs... just like they were when I was a kid. I worked part-time for minimum, or near minimum wages when I was in high school and college, full-time during summer break. I bet many of you did the same thing. It taught me the value of a dollar, and instilled a positive work ethic in me that have served me in good stead all of my life. Started cutting grass in my neighborhood when I was 10 years old... Not full time... just had 4 or 5 lawns, but I cut them all summer until football practice started... I loved it! I provided a service to people and was paid for it... it felt great to earn my own money. And if kid's today spent more time working outside, instead of playing video games or updating social sites with their every move; America wouldn't rank #1 the world, in childhood obesity. I have watched two episodes of the show, and I have not been impressed. For this kind of show to work, the hosts need unique voices. Newt and Stephanie don't have unique voices. Newt sounds like a monotone professor and Stephanie sounds nervous. I have nothing against neither of them, but I know good tv when I see and hear good tv. Put some passion into your show, if not, we will be wondering "what happened to that Crossfire show." Get it right, you meant a republican sounds mono tone and a democrat does not. Gov. Perry has bragged about all the jobs in TX he created, but they are mostly minimum wages and workers cannot survive on those. Please check your facts! Texas is one of the largest states in the US... a top job creator the last 4 years and the majority of those jobs are middle to high income jobs! Most of the Maryland jobs that O'Malley brags about are low paying service industry positions. It's hard to find the stats buried on his 'STATESTAT' page, but they are there. O'Malley is skewing job statistics every time he opens his mouth. Because it is easier to survive on NO JOB rather than a minimum wage job? Did you not hear him finish his answer? Within 1-2 years most of those minimum wage earners are promoted to a higher paying position. At least he is creating jobs. If O'malley isn't sweating he should be. He has driven more business out of Maryland then any other gov. in history. He also has raised taxes and fees more then any other gov. He does't care about anyone but his self and his political career. You are 100% correct. Socialist Martin O'malley is taxing the Maryland middle class to death, raising taxes over 40 times. The Maryland gas tax is now one of the highest in the nation, and lets not forget about good ole Martin's rain tax where the citizens of Maryland get taxed every time it rains. I've lived in Maryland all my life, Martin O'malley has single handedly run Maryland into the ground with all his taxes. I want out I want to move to a free state I want to live in America not Solcialist Maryland. Socialist O'malley hates firearms and it shows, and he also tramples on the Constitution when it comes to firearms. You can't conquer the people as long as they're armed.